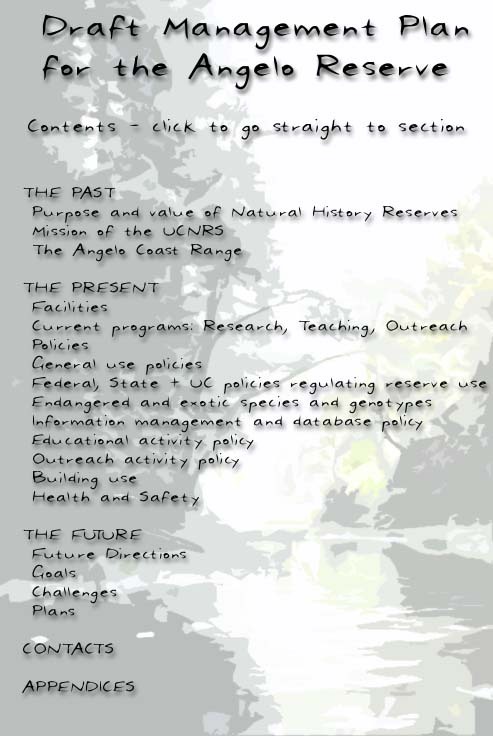 One purpose of this management plan is to preserve, deepen, and broaden opportunities for the Reserve to support further contributions of this nature to researchers and students at various levels.� The benefits of these contributions should ramify throughout society, as Angelo alumni take jobs in schools, universities, and agencies, and share the results and insights they have developed while working at the Reserve.� Another purpose of this management plan is to identify key challenges facing Angelo, outline major goals for the next five years, and to propose ways reach these goals. Click here to begin or use the overview to the left to go directly to specific sections. Written by Mary Power with assistance from John Latto, Pete Steel and Collin Bode. Web conversion by John Latto.